The campaign is looking to increase awareness about the plight of British pubs and in the process raise money for the Licensed Trade Charity. 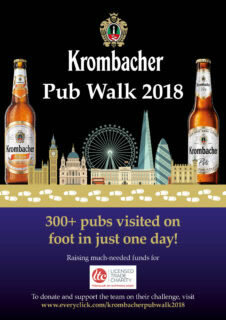 The mammoth challenge taking place in London will see a Krombacher team cover in excess of 30 miles as they aim to visit 300 pubs on foot in 24 hours. The fundraisers will begin on Friday 16th November and will be raising money in aid of the Licensed Trade Charity, which for the past 200 years has been helping people who work or have worked in pubs, bars and breweries when they are in need. “Fundraising for the Licensed Trade Charity can make a real difference to people’s lives. The grants that we provide to pub, bar and brewery people in times of hardship can cover such items as rent and deposits for accommodation, bills and furniture. All money raised helps us to support those in need“. The Licensed Trade Charity provides valuable support to those who work, or have worked, in pubs, bars and breweries. This can take the form of financial support, along with a dedicated free helpline providing advice on health, mental health, housing issues, debt and relationships, and can also provide up to six counselling sessions for those in need. Other services include telephone befriending to combat loneliness in former trade workers, and retraining grants. 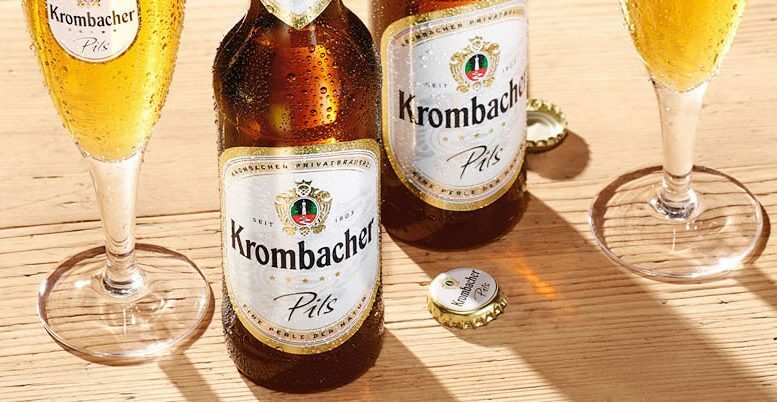 Krombacher beers have been produced exclusively in the small town of Krombach, nestling in the beautiful Siegerland Hills of Westfalia, central Germany since 1803, adhering to the German Beer Purity Law of 1516 (Reinheitsgebot). Combining time-consuming methods of the traditional German brewers with state-of-the art technology, the brewery only uses the best, 100% natural and wholesome ingredients including the finest two-row summer barley, Siegel hops from Hallertau and its own specially cultivated yeast.